Oil prices have nearly doubled over the last two years, and they have room to run even higher in 2019. The price of the U.S. benchmark West Texas Intermediate (WTI) gained 12.47% in 2017 and gained 40.47% since hitting its low of $43.01 on June 23, 2018. But WTI oil prices climbing didn't come as a surprise to us. Due to global economic changes, oil prices are falling. U.S. sanctions against Iran are set to begin on November 4, 2018. With that in mind, Saudi Arabia has said they will increase their production of crude oil. When U.S. sanctions begin against Iran, the supply of crude oil supplies will be limited. Saudi Arabia has promised to output a record amount of oil, promising to produce 11 million barrels a day. This will offset the losses of crude oil from Iran. As well, U.S. relations with Saudi Arabia might go through another change, creating more stress. The death of Saudi Arabian citizen and Washington Post journalist Jamal Khashoggi has created turmoil that could affect how the two countries see one another. This might also affect global oil prices. Another global economic issue that's affecting oil prices today is the U.S.'s relationship with China. Specifically, the growing trade war between the two countries is affecting the price of oil. As well, the tension between China and the U.S. will potentially lower the demand for crude oil. Lower demand for crude oil will result in a lower crude oil price today. First, the fundamentals of the oil market are strengthening. What we mean is that a balance between supply and demand is forming, creating a floor for oil prices and room for them to expand higher. One of the reasons oil prices have been so volatile over the last three years was due to the fundamentals of the market falling out of alignment. When WTI crude oil prices were trading over $105 back in 2014, oil producers tried to produce more oil to take advantage of the triple-digit price. That was especially true in the United States' shale oil patches, where oil is abundant but expensive to drill. U.S. oil production skyrocketed 72% between 2010 and 2015, when annual production hit a four-decade high. But that surge in production meant excess supply was added to the market. And adding more supply without rising demand is a recipe for falling prices. From peak to trough, oil prices fell 74% between 2014 and 2016. As oil prices fell, American oil production dropped 6% between 2015 and 2016. But now we are seeing more stability between supply and demand, and that's helping to slowly lift the oil price floor. For instance, even as oil prices closed out 2017 at their highest prices of the year – and have even gained more since 2018 started – American oil exports are also hitting their all-time highs of 2 million barrels of oil a day. Second, OPEC has extended its production cut agreement through 2018. OPEC's most recent agreement started on Nov. 30, 2016, and capped the oil production of the cartel and 11 other participating countries, including Russia, at 32.5 million barrels a day. OPEC has since decided to extend the agreement twice. It first extended the agreement in May 2017, but then extended it all the way through 2018 during its November meeting in 2017. This is a bullish catalyst for oil prices, because OPEC has been adhering closely to its agreement. In fact, the compliance rate reached 120% in September 2017. Now that we know OPEC will continue to keep its oil cut agreement all the way through 2018, we expect the oil market to continue balancing. That will boost oil prices over the year. Third, global demand for oil is rising. The International Energy Agency (IEA) is forecasting oil demand will rise by 1.4 million barrels a day in 2018. Rising demand leads to higher prices as long as the supply remains steady. And with OPEC capping its oil production, we're expecting this increase in demand will help push oil prices higher. Even more importantly, rising demand will help relieve any excess supply produced by American shale oil producers. American shale oil production will rise alongside oil prices. But instead of excessive production crashing the market, like in 2014, we should see a more balanced market in 2018. Fourth, geopolitical events in 2019 are primed to raise oil prices. Look no further than Venezuela, which has the world's largest oil reserves and produces nearly 2 million barrels of oil a day. The country is on the verge of collapse, as its debt has reached crisis levels. The inability of the government to function has led to rising crime and food shortages, which is galvanizing opponents of Venezuelan President Nicolas Maduro's regime. If Venezuela's government collapses, or the country descends into a violent revolution, its oil production could be weakened or taken offline entirely. Removing nearly 2 million barrels a day of production would boost oil prices. And the Middle East is as volatile as ever. The United States decertified Iran's compliance with the nuclear accord, paving the way to renew sanctions against the country. If the United States sanctioned Iran's 3.8 million barrels a day of oil production, the country would likely have to scale back. Iraq, Libya, and Nigeria are also in the throes of internal violence, which is prohibiting these countries from reaching full production capacity. We aren't expecting conditions to improve there in 2019. We recommend two ways to profit from rising oil prices. First, you can take a long position on oil prices and profit as they rise. One of the most popular ways to play rising oil prices is to buy crude oil futures contracts. If oil prices rise above the futures contract price, then you can sell them for a profit. But trading futures contracts is risky – they could become worthless if prices fall – and prices move rapidly. A simpler way to take a long position on oil is through an oil exchange-traded fund (ETF). Dr. Moors recommends the United States Oil Fund ETF (NYSE Arca: USO). USO tracks the daily price movement of oil. When oil prices rise, you profit. And because USO is an ETF, you can buy and sell it just like a stock. There's no need to trade complicated futures contracts. Second, you can profit from rising oil prices by owning the right oil company stocks. But not every company in the oil industry will benefit from rising oil prices, so you need to find well-run companies with potential to grow if you want to profit. Big oil company stocks are examples of oil stocks investors want to stay away from. Even though they might be some of the largest companies in the world – and household names – oil companies like Exxon Mobil Corp. (NYSE: XOM), Royal Dutch Shell Plc. 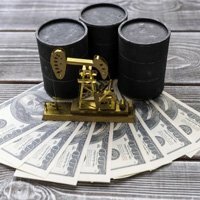 (NYSE ADR: RDS-A), and Chevron Corp. (NYSE: CVX) are too bogged down with debt and billion-dollar projects across the world to grow much when oil prices rise. Instead, look for smaller companies with proven business models. One of Moors' favorites is Plains All American Pipeline, LP (NYSE: PAA). As a midstream oil company, PAA doesn't have to jockey with goliaths like Exxon, who are buying up billions in real estate to find the next productive oil patch. PAA simply transports oil from the oil patches to hubs like Cushing, Okla., or the Gulf of Mexico. Firms like PAA keep their expenses low and generate more revenue as oil prices – and oil production – rise, which means more of their profits get passed on to shareholders. With a lot of global political uncertainty in oil-producing countries, investing in oil might sound tricky right now. The U.S. relationship with Iran and Saudi Arabia are shifting as the overall political climate shifts. U.S. sanctions on Iran are stressing our relationship with the country and changing the face of the oil market. We see a bullish market for the future of oil prices. Use the tips provided by our investors to get a return on your investment in oil. Oil prices aren't the only place we're investing right now. We're also very bullish on investing in Bitcoin. This new and exciting opportunity is perfect for a certain type of investor. The South China Sea is about to get violent, and the Chinese have an alarming new superweapon they think gives them the upper hand. Or at least that's what their war hawks think. But they couldn't be more wrong. Thanks to a small $6 U.S. defense contractor with a top-secret technology, the Pentagon has an ingenious new checkmate move designed to stop a Chinese sneak attack dead in its tracks.